This Japanese-made 1GB Nike Shoes USB drive is attratively price at around Rs 1400($20) which is compatibile both for PC and Mac(needless to say these). 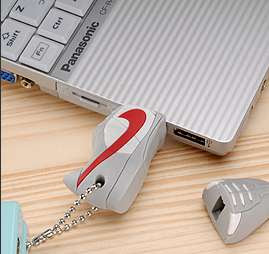 This stylish Nike Shoes design implemented on USB drive hasn't yet drawn attention of Nike Shoe company. But when it does, there would be lots of legal complications. So, it is rush buy. Get it quickly as possible, because tommorrow, it won't be there. This USB drive has keychain utility as well as the 1GB portable storage as it's main purpose. Mine's just black and boring! I want this one! I haven't seen it around here, think I should go out and search! Mero afno pen drive ta skeleton matra baki cha. Tyo ni sathiley firtai gardaina. Ashish, hora?? saathi sanga phirta gara bhanney ni aafno pen drive..
i would like to see some nike shoes made by japanese, isn't cool?